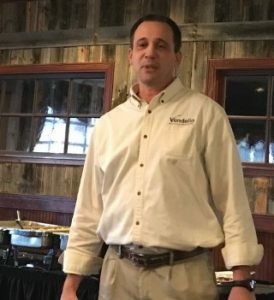 Jeff Kreill superintendent for the Parks and Rec along with many other members from the leadership team, spoke to the club today about all the happenings at the Parks and Rec. Rob Bradley controller at E-Mek Technologies in Vandalia provided business insight to the Vandalia based company located on Webster. Jeff Harris is project manager over a solar panel technologies project made out of circuit boards and LED’s. This product can provide an energy source or can heat driveways or roadways when heated. 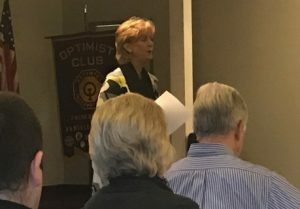 Candace Farst spoke to the Optimist Club today about the different art projects in Vandalia. Amber Holloway, assistant Vandalia city manager. She spoke to the club about Vandalia occurrences today. Jerrod Fraley, Vandalia Officer and member of the Regional Emergency Response Team spoke to the club yesterday. It was very informative to learn about this joint task force between multiple cities. Stephanie Emerick speaks to the club about Down Syndrome. Stephanie Emerick spoke to the club today. She is a huge community volunteer and spoke to the club today about Miami Valley Down Syndrome Association, Special Needs Recreational and site development, informational tracking system for youth and special needs and Buddy Walk. Dr. Barton from Neely Dental speaks about oral health and the body. 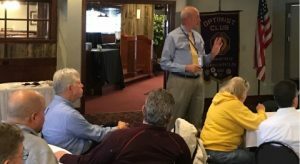 Dr Barton, from Neely Dental, spoke to the club about systemic health and the overall impact of oral health on the body. Judy Dodge speaking to the club about hunger in the Miami Valley. Judy Dodge speaking to the club about hunger in the Miami Valley area. Tom Luebbe speaking to the club about Vandalia Butler High School. Tom Luebbe, VB high school principal, spoke to the club. 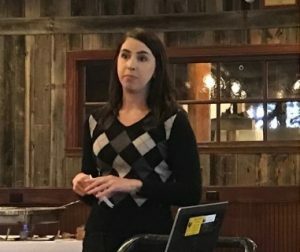 One of the items discussed was expanding curriculum offerings to include things such as engineering design, computer science, biomed science, drone technology and others.